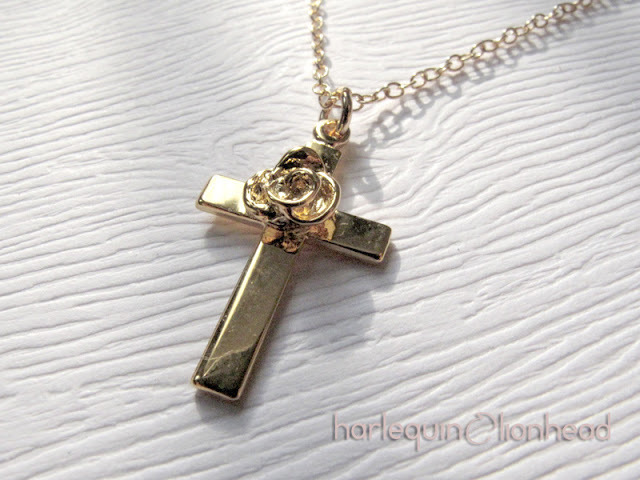 Little rose crosses make great gifts! This is a custom order. I was tasked to create little crosses for 2 6-7 year old girls. 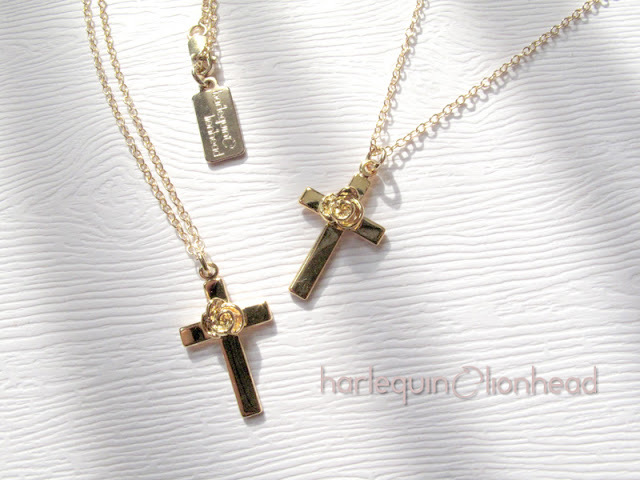 I thought it would be adorable for their crosses to be adorned by a single little rose. 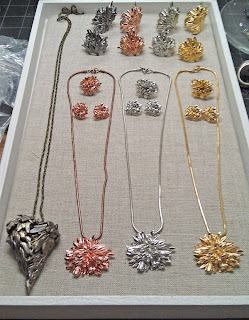 Each rose is about 3/4 inch, gold plated and hung on a 14 inch long gold filled chain. 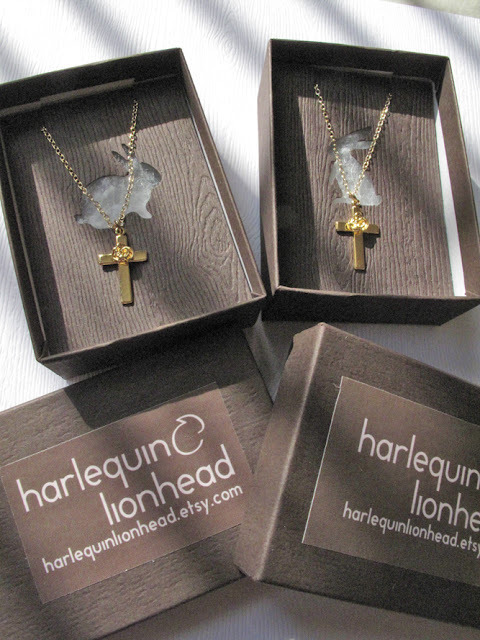 It is completed with my brand new jewelry tag with Harlequin&Lionhead logo! The best thing is that you cannot find them anywhere else. These are made for this order only. They are packed with love! Those are accompanied by my Mr Harlequin (Left, Toffee) and Mr Lionhead (Right, Charcoal) silhouettes. I hope the little girls will find these crosses as precious as they are to their family and enjoy the necklaces for years to come. To order your own customized jewelry, just email me or visit my Etsy shop for some ideas! Like all creation, it starts with a thing that pulls your heart's string. In this case, it was Alexander McQueen. 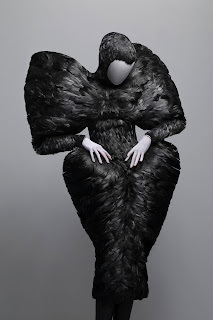 Not surprisingly, the show at the Met was an inspiration for a lot of designers. I have always been fascinated by feathers and the idea of flying. In high school, for awhile, all I drew were wings. You could see it on the blackboard (now you know my age, it was black and then green and then white...), on my textbooks, drawing pads...The original idea for the Whirls #1 ring was a pair of wings spread in a distorted way on your finger. Then I saw the Horn of Plenty dress at the show. 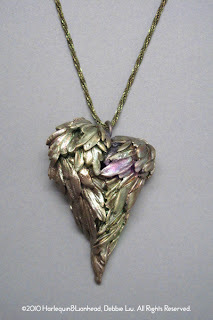 Not only was it made of feather, it has the most interesting shape one always omits when looking at a pair of wings, though it stares back unmistakably at you - a heart shape. Two wings closed and perched on the back forming a heart shape is what we see everyday looking at birds at parks. And McQueen amazingly took it to adorn the hip area of the dress. 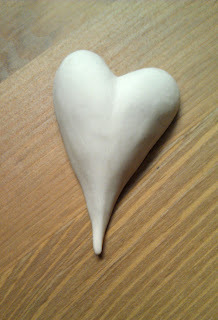 I adore the elongated curves of a heart. 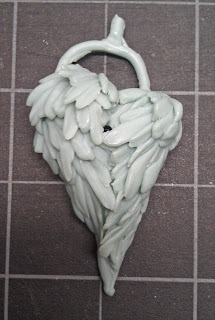 So I thought I'll combine the beautiful shape with dramatic texture of feathers and make a large size pendant. 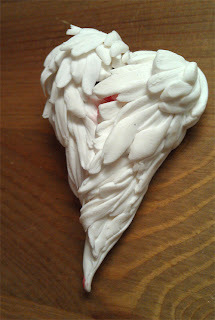 I started with polymer clay, as for the whole Whirls Collection. 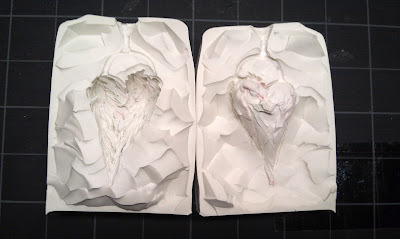 I created a heart shape as a foundation (1st image of this post), then developed the feather on top of the foundation to form the pendant, separated the pendant from the heart foundation and baked the clay to harden it. 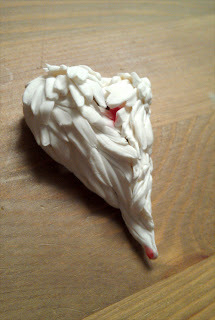 Then the clay model was sent to my mold maker to make a silicon mold. 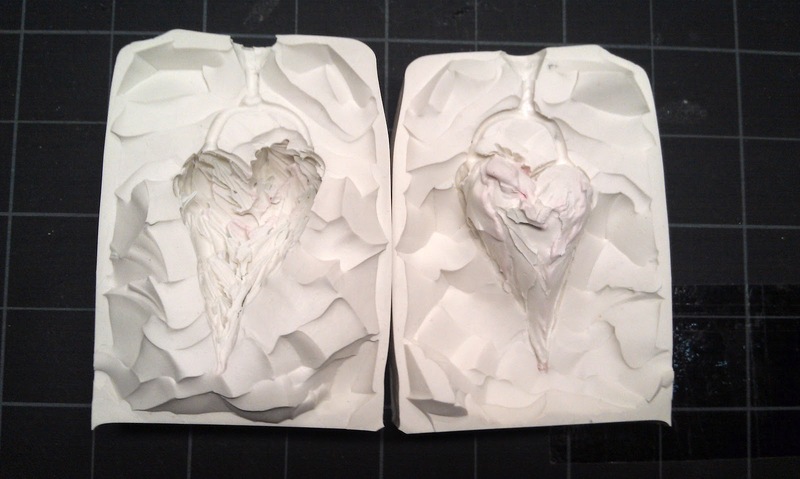 From there, it generated a wax model, which I used to hollow out the back side further and reduce the weight of the wax model. Then it was cast into brass and soldered with a ring on top for a chain to go through. 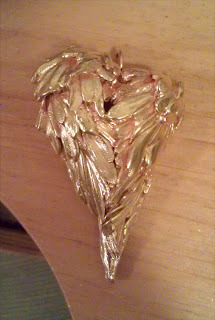 The heart feather pendant was still very heavy. I think it was first over 2 troy ounces in weight. I had to hollow out a couple times to bring it to within 2 troy ounces. Imagine casting it in silver, it would be quite an expensive piece. So currently I'm keeping it in brass. After I polished the piece to a matt finish, I oxidize it to create an antique look. 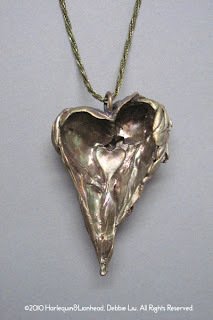 This pendant measures 1.5x2.25 inches in size and looks stunning on the front with the layers, and interestingly eerie on the back with the heart muscles and veins around the little heart shape in the hollow chamber. The oxidation is achieved here in the picture with liver of sulphur, which changes metal color into shades of yellow, blue, green, pink, purple and black based on heat. The purple here is quite a random result and it needs to be protected from air with a sealant to be preserved. The 30-inch long chain is also brass and tarnished the same way into a vintage looking dark color. This is my current Whirls Collection. More to come, watch out for it! Animal Asia is a charity organization aimed to save moon bears from cruel hunting and harvesting in Asia. My friend, Madeleine Truax, is a the NY volunteer worker for the organization and she is helping them host a dinner gala and silent auction in August to raise fund to save moon bears. She turned to me earlier to see if I can help source donation of jewelry for the silent auction. 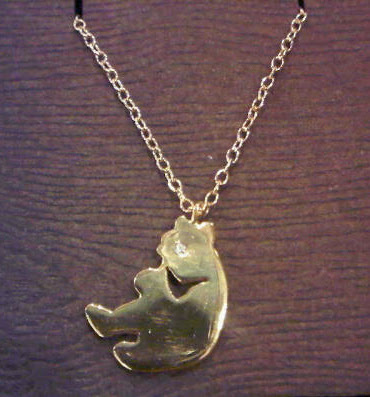 I figure what would be a better jewelry piece than a little moon bear for the bear lovers? So I designed and created 2 pendants and necklaces for the event. 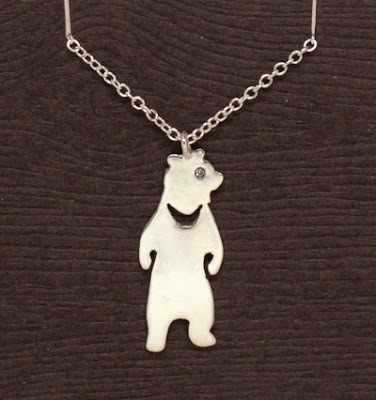 One is the standing moon bear above in sterling silver with a swarovski crystal eye on a 17" sterling silver chain. The other is the sitting moon bear below in brass with 24K gold plating, also with a swarovski crystal eye, on a 17" gold-filled chain. These are donated to the organization. These are not for sale in my shop right now so if you want them, either contact me at harlequinlionhead@gmail.com or join the Animal Asia silent auction on August 21, 2011. Click HERE to find out more. If you are interested at custom ordering these from me, it is valued at $70 each. Rose gold plated version is also available and all profit minus cost of production goes to Animal Asia.